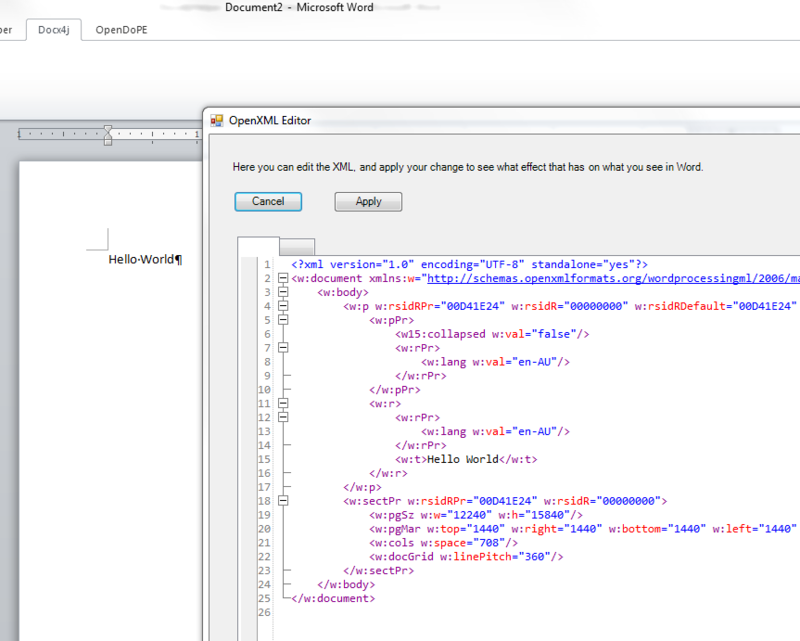 View Open XML right from within Word, and see what happens when you edit it. 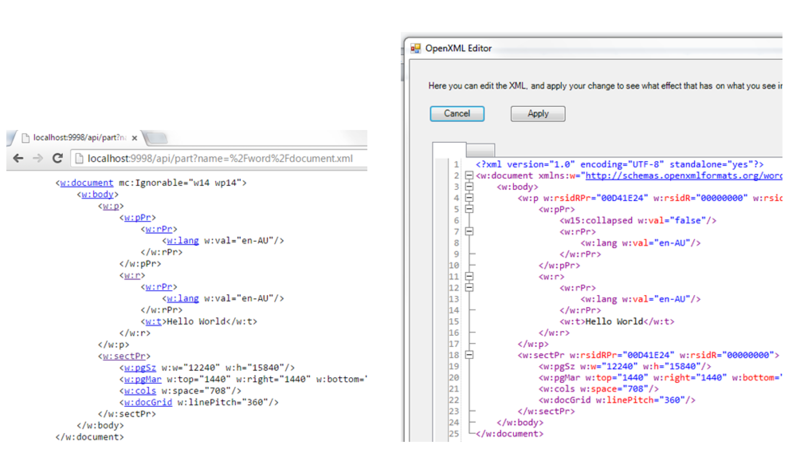 Or generate corresponding docx4j Java code, with deep links into the corresponding docx4j source code and Open XML spec. 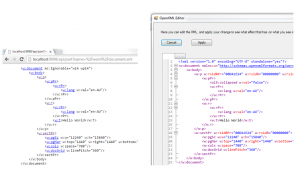 Regular users of docx4j will be aware of our webapp, which amongst other things, generates docx4j Java code for the specified Open XML in your sample docx/pptx/xlsx. To address these issues, we’re now offering the code gen functionality as a Word AddIn. If you install the Word AddIn, this means you can now generate code without your docx leaving your computer. This is all feasible because docx4j can run as a DLL in a .NET project, thanks to IKVM! You can download the installer. After you complete the landing form (using your corporate email address, not gmail etc), you’ll be sent a download link. To generate code, first press the “Load Helper” button. Its inviting you to start a local web server which will run the same code as the existing webapp. Just choose a port you aren’t already using. If for some reason you want to browse using Internet Explorer (as opposed to your default browser), check the box. 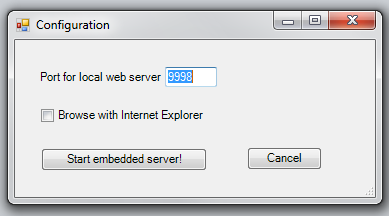 It’ll take a little while to start the server; you’ll see a dialog when its started. Now you can generate code. To do so, select something in your docx, then click the “Generate Code” button. 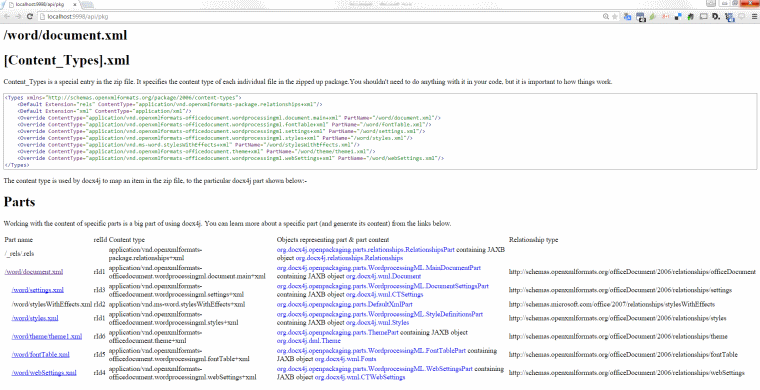 That’s the view of the docx package, which will be familiar if you’ve used the webapp. For how to generate code from here, see our earlier post. What about the “Edit OpenXML” button? You can go ahead and edit it, then click the “Apply” button. 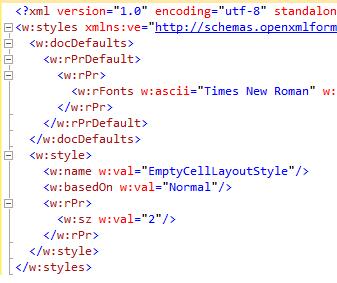 If Word likes your XML, you’ll see your changes on the document surface. Ctrl Z should work for undo. The first way we described uses your web browser; the second is a Windows Form. These two views have different features; maybe a later release will unify them? There’s no reason in principle we couldn’t make a similar AddIn for Powerpoint and Excel. In fact, we plan to make these, once any teething issues have been ironed out in the WordAddIn. In the meantime, for pptx and xlsx, you can continue to use the webapp. Otherwise, please check the Docx4jHelper AddIn forum. We’ve got some ideas for where the AddIn goes from here, but we’d love to hear yours. We’ve been tweaking the schemas – especially wml.xsd – to make the Java classes generated by JAXB’s xjc more user-friendly. I’m satisfied that this is permitted by ECMA, so I’ve put the modified schemas into subversion . For this to apply, it needs to be an “Ecma Standards or Technical Report”. Office Open XML was so approved. So the only possible glitch would be words to the effect that the schema aren’t part of the official standard. So the ECMA standard’s XSD are “free of copyright” – an explicit waiver of copyright. So no problemo in creating derivative works. We’re pleased to announce that docx4j is now available under the Apache License (v2). This is a response to feedback on an earlier post. This is also the last license change we’ll be making to docx4j. Word documents are mostly manipulated in corporate environments. This change removes barriers to adoption of docx4j by business and institutions. docx4j uses org.merlin.io to efficiently turn streams inside out. That package had been available under the GPL. Its author, Merlin Hughes, today kindly released it under v2 of the Apache License, so we now use it under that license. There’s a new nightly build of docx4j available from the downloads page if you want to grab it. This build can load/save to/from a WebDAV server – more on that in another post. Microsoft Office Online .. soon? Nick Carr has sparked speculation that Microsoft will soon unveil its strategy for bringing its Office suite online – which to me means a way of working with Office documents on any computer which has an internet connection. If you are connected, I’d expect you to be able to collaborate with others in real time; if you are not connected, I’d expect the software to work in offline mode. When I say “any computer”, I don’t mean to restrict that to any particular operating system (and indeed, Silverlight runs on the Mac, and Microsoft has announce it is working with Novell on a linux implementation). What good is collaboration software if some of the people you need to collaborate with can’t play?I thought I’d make some predictions about the business model. does each end user pay, or does a collaboration originator pay for the right to invite a certain number of collaborators? what support for Mac and Linux users, and when? Whether each individual user is required to pay, or the originator pays, will reveal much about how Microsoft regards its online offering. The latter model, that the person who originates a collaboration session pays for a certain number of people to be able to collaborate (ie whatever their platform), would show that their focus is firmly on collaboration. This is the model we would use for any plutext SAAS offering (available to people who don’t want to install plutext server internally, for free or a fee). Enterprise version (ie behind the firewall). There will be a version an enterprise can install on its Sharepoint server, for those businesses which are not comfortable with their documents being hosted externally. I’m sure Microsoft can work out how to let people give access to people outside the firewall as necessary. An enterprise licensee will be able to invite people outside the enterprise without charge. Cloud version. I expect there will be a cloud version for SMBs. I think you will be able to use this for free, provided you have a license for the traditional Office product. You will definitely need this (2007 version) to originate collaboration around a document (ie invite other users) – unless you are prepared to pay a full price for the online offering. Maybe anyone will be able to accept a collaboration invitation (ie whether or not they are licensed to use Office), making the “who pays” question mute. To create a new document (or print it? ), I expect you will need to have a licence for the traditional Office product, or pay for the SAAS offering. Mac and Linux support. I think Microsoft will offer Mac support sooner or later, but delay any hint of support for Linux for as long as possible. This is because Linux is much more of a threat than OSX (two reasons: (1) Linux is free, and (2) it is very easy to install it on your existing Windows PC). That said, they might have it “only on Windows” to try to keep people there – until some critical tipping point is reached. I would say that even now, the only thing stopping Microsoft from seeking revenues from Linux users are the inevitable press headlines along the lines of “Microsoft admits defeat” that would come with this. The cost of this in terms of perception would surely outweigh any incremental revenues in the short term. Mac users may be able to use it for free – provided they had an Office license they were able to associate with their online user ID. docx only. The documents which come out of this online service will be docx documents, not binary or RTF. This will help to make the new format ubiquitous. I wonder whether the collaboration protocols will be published under the recent interoperability initiative? If they are, the way would be open for a rich world, in which docx4all could potentially play… I’d be pleasantly surprised if they were, and there was nothing stopping someone from making a client or server of their own. If anyone else could create a server, then why not get rid of it altogether and go peer-to-peer? Maybe, just maybe, the thinking is that it would take forever for someone other than Microsoft to create a fully featured server, so third party implementations are to be encouraged (as is presently the case for OpenXML), since Microsoft’s offering will always be the RollsRoyce implementation which attracts the most usage, with the other implementations adding value to the ecosystem. This week, thanks to JAXB, we added strongly typed content models for the Styles part, and the Numbering definitions part of a docx. Have a look at Styles.java and Numbering.java, used by their respective parts. I’ve added a page to the wiki, showing how easy it is to programmatically open and edit an existing document. ST_OnOff is used extensively in the XML Schema. Here is the openiso.org link (nice resource!). This simple type specifies a set of values for any binary (on or off) property defined in a WordprocessingML document. For example, the b (bold) element has an attribute @val of type ST_OnOff. There are several problems with how this is done. The first is that its possible values are “on, 1, or true”. OOXML should just use the XSD boolean data type, which doesn’t allow “on” (or “off”). For related comments, see here, here, and here. Denmark and France seem to be the strongest advocates of the use of xsd:boolean, and I hope they get their way. The second is that it is left to the specification text to say that if the attribute is omitted, its value is implied to be true. That should be expressed as part of the schema. I don’t think Denmark or anyone else made this second point. Which brings me to the the third problem with ST_OnOff (and the schema in general), which is that it generates ugly code in JAXB and other binding frameworks (presumably .NET included). The built in schema data types produce much nicer code. that the schema be expressed in such a way as to generate the simplest code. You are currently browsing the archives for the OOXML category.